-I suspect this is going to be a popular title for WOW this week. I just couldn't resist. Love the cover! It looks so different to the VA series. Can't wait to read it - nice pick! I saw this cover today on Entertainment Weekly. I think it's pretty cool. I like the design on her face and in the title. Plus, it's set in California. My favorite state! LOL I've never read The Vampire Academy books. 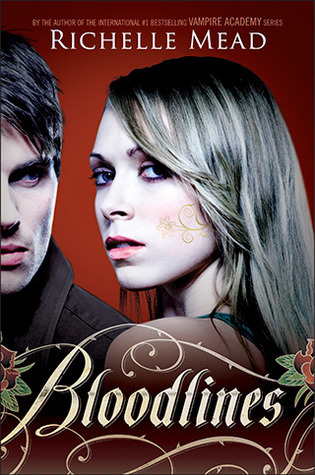 Would love to check out Bloodlines. I can't wait for this. I've still got to read Last Sacrifice, but I love the world Mead has created. That cover looks fantastic. This is actually the first time l have heard of this book, great pick. Added to GR! I think you're right this might be a popular choice this week, you're the second person I've seen choosing Bloodlines for their Waiting on Wednesday, but I can't blame you I was tempted to put it myself but it wouldn't be right since I can't even read the whole synopsis in fear of being spoiled for VA since I've just started the series. I finished Frost Bite last week and loved it. I still haven't read The Last Sacrifice! I need to get on that. I'm glad to see that Richelle Mead will be writing another YA series though, especially since it's a spin-off. Sydney's character intrigued me, from what I've seen of her so far, so I'm interested in seeing how it is! I've read The Guernsey Literary and Potato Peel Pie Society and I really enjoyed that book too. Your right that Guernsey and Major Pettigrew have the same feel to them, but they have completely different plots. Both are amazing books though. Great choice on your WOW. I feel like I'm the only person who hasn't read the Vampire Academy series so one of my New Year's resolutions was to read it and to start her spin-off series. Cannot wait!!! I love Sydney and am so excited. But, I mean...I hope there's a least a LITTLE Dimitri. Just one little mention and I"ll be a happy camper!